More than 100,000 websites, Internet users, and organizations are participating in a massive online protest against the FCC’s plan to gut protections that keep the web free from censorship, throttling, and extra fees. Protesters have also gathered outside the Senate in DC. 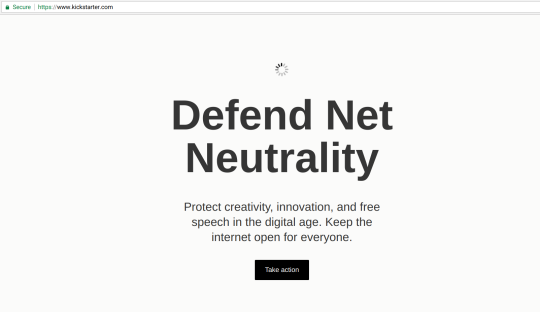 Many of the most popular websites on the web are participating in an Internet-Wide Day of Action to Save Net Neutrality today to oppose the FCC’s plan to slash Title II, the legal foundation for net neutrality rules that protect online free speech and innovation. 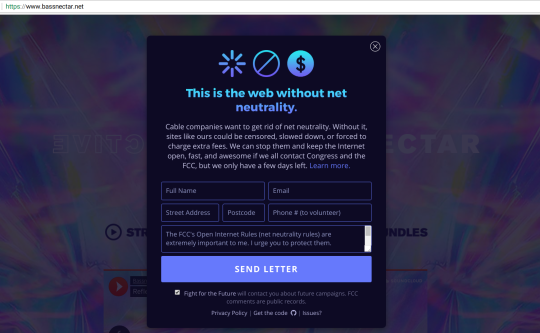 Starting at midnight, a flood of major web platforms like Twitter, Reddit, Netflix, Spotify, Airbnb, Amazon, Mozilla, OK Cupid, Vimeo, Pornhub, Imgur, and Soundcloud began displaying prominent protest messages to their users, encouraging them to take action by contacting the FCC and Congress through tools like BattleForTheNet.com that make it easy for Internet users to make their voices heard. 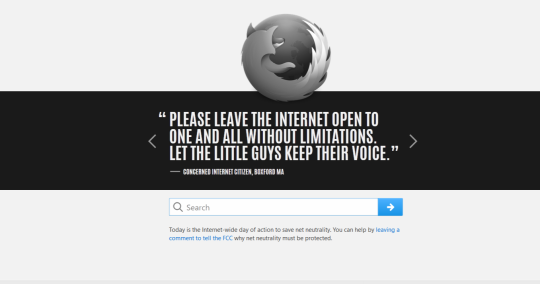 “Today is a historic moment when the Internet is realizing it’s power. We’re massive amounts of creativity and action coming from every corner of the Internet, from the smallest and weirdest nooks and crannies of the web to the most popular websites on earth. 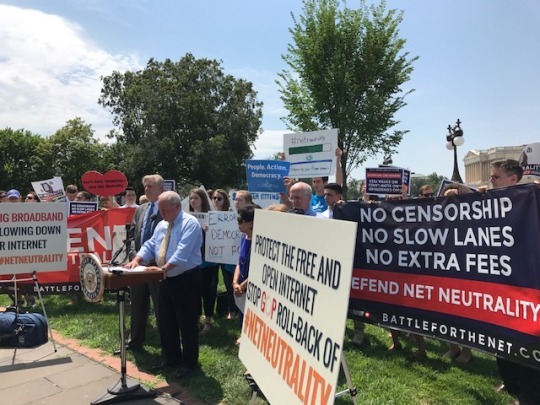 And this doesn’t end today – this protest is the kickoff of a sustained campaign to keep the pressure on lawmakers and the FCC to do the right thing. This is our opening salvo, and it’s a massive one. More than 100,000 people, sites, and organizations signed up to participate the effort ahead of the 12th, and many times that will have joined in by the end of the day. The list of sites and apps participating has grown so quickly it’s almost impossible to keep up, but participants include Automattic (Wordpress), eBay, Rosetta Stone, Pinterest, Amazon, Mozilla, Netflix, Etsy, Kickstarter, Soundcloud, Dropbox, Spotify, Facebook, Google, Snapchat, Medium, Y Combinator, GitHub, Pantheon, Opera, Bittorrent Inc., Shapeways, Nextdoor, Stack Overflow, Funny Or Die, Dreamhost, and CREDO Mobile, Goldenfrog, Fark, Chess.com, Namecheap, DuckDuckGo, Checkout.com, Sonic, Ting, ProtonMail, O’Reilly Media, SlashDot, Dribble, Dischord, SourceForge, and Union Square Ventures. Organizations participating include Fight for the Future, Free Press Action Fund, Demand Progress, Center for Media Justice, EFF, Internet Association, Internet Archive, World Wide Web Foundation, Creative Commons, National Hispanic Media Coalition, Greenpeace, Common Cause, ACLU, Rock the Vote, American Library Association, Daily Kos, OpenMedia, The Nation, PCCC, MoveOn, OFA, Public Knowledge, OTI, Color of Change, MoveOn, Free Software Foundation, Internet Creators Guild, the Women’s March, and many others.